Our Orange 4 pk is OUT OF STOCK, but we have ordered more! You are still able to purchase it now and we will ship it to you as soon as it arrives. Questions? Please call 1-800-438-5346 or email us at info@Lehmans.com. Our Cherry Strawberry 4 pk is OUT OF STOCK, but we have ordered more! You are still able to purchase it now and we will ship it to you as soon as it arrives. Questions? Please call 1-800-438-5346 or email us at info@Lehmans.com. Our Ginger Ale 4 pk is OUT OF STOCK, but we have ordered more! You are still able to purchase it now and we will ship it to you as soon as it arrives. Questions? Please call 1-800-438-5346 or email us at info@Lehmans.com. Our Root Beer 4 pk is OUT OF STOCK, but we have ordered more! You are still able to purchase it now and we will ship it to you as soon as it arrives. Questions? Please call 1-800-438-5346 or email us at info@Lehmans.com. 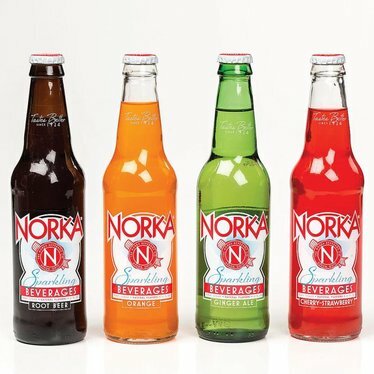 First made in 1924, Norka's sparkling drinks vanished in the 1960s, until now. A native Akron man has brought back his beloved hometown soda. 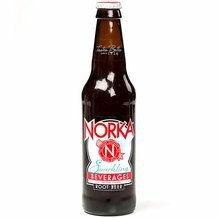 Enjoy a different taste than ordinary soda, subtle but sweet with natural flavors and pure cane sugar - no high fructose corn syrup. 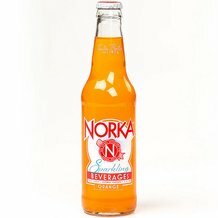 What's Norka? Spell it backwards and you have Akron - a small city in Ohio near us known as "Rubber City" and home of a basketball legend. 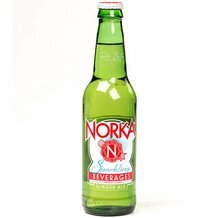 Akron is also where Norka drinks were first made years ago. This beloved sparkling drink vanished in the early 1960s, until now. A native Akron man decided to bring the iconic brand back. Cherry Strawberry: Carbonated water, cane sugar, natural flavor. Citric acid, potassium sorbate (preserves freshness), sodium benzoate (preserves freshness), gum acacia, FD&C Red #40, glycerol ester of wood rosin. Ginger Ale: Carbonated water, cane sugar, natural flavor, caramel color, citric acid, potassium sorbate (preserves freshness), sodium benzoate (preserves freshness). 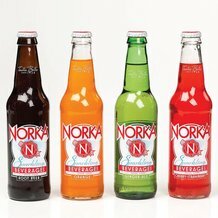 So far have tried orange and root beer. Enjoyed both very much. The flavors are strong tasting. That s good. Will try cherry/strawberry and ginger ale next.